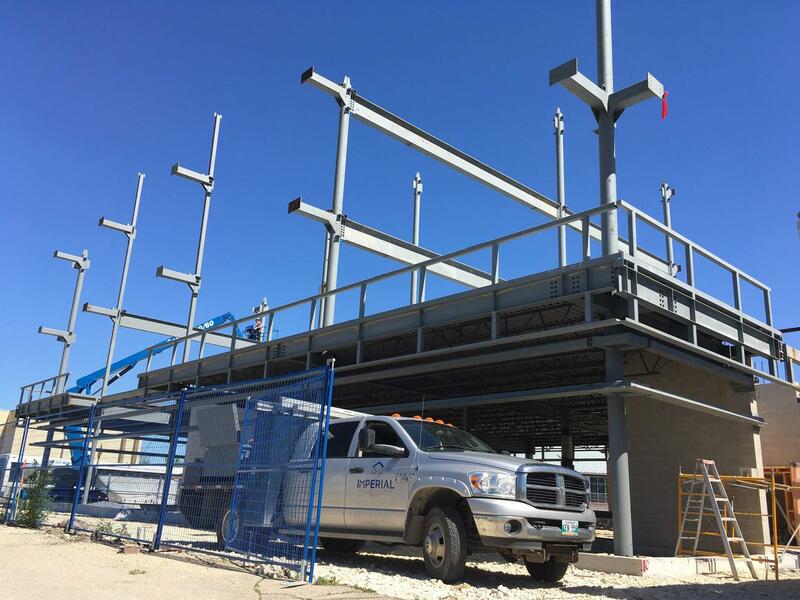 WINNIPEG, MB – Osborne Place, a new office building underway at the corner of Osborne Street and Pembina Highway, is slated for completion in December, according to the property's manager, Imperial Properties. The six-storey building at 257 Osborne, which includes more than 32,000 square feet of office space, offers tenants an open floor plan with considerable freedom for customization. They will also be able to enjoy numerous shopping and dining options in the area. Osborne Place also happens to be located at one of Winnipeg's most iconic and traffic-heavy sites, the so-called Confusion Corner, and is part of a larger plan by the city to reduce congestion and transform Union Station into a downtown transit hub. Rapid Transit access is another of the property's major attractions. Adrian Schulz, ACCI, president and CEO of Imperial Properties, said that limited office and retail space is still available on the property, and that he expects tenant fixturing and move-in to occur by the end of the year. "As plans developed for Osborne Place and the scope of the project expanded, it became increasingly clear that this would be an attractive site for prospective tenants, and that has proven to be the case," said Schulz. "Osborne Place offers tenants so many fantastic options in terms of customization, location and amenities, as well as convenient parking and onsite property management." With over 91,100 vehicles passing by Confusion Corner each day, the site was targeted as a prime spot for revitalization, particularly given Winnipeg's growing emphasis on mixed-use developments and high-rise buildings. "It's very exciting for Imperial Properties to be involved in the city's push for the sort of development exemplified by Osborne Place," said Schulz. "This particular development has been in the works for more than two years, and the fact that so many cars pass the construction site each day has really gotten the community energized about what's happening." Schulz said that the unique location of the site has also allowed construction to proceed without much disruption to traffic. Originally planned as a single office building, Osborne Place generated sufficient excitement from the city and community that a second building, a 10-storey residential structure, is now planned for an adjacent site at 265 Osborne. Imperial Properties will oversee leasing as well as general property management for Osborne Place. Other partners on the project include Quincore Projects, the general contractor; Allan Coppinger, the architect; and DIN Projects, which is overseeing the architectural design. "Osborne Place is such an exciting project for Imperial Properties and the entire city of Winnipeg," said Schulz. "We're looking forward to continued progress and eager to share more news as completion draws nearer."